Nusa Dua is one of Bali’s tourist attractions that is very impressed with the luxury and very neat. The cleanliness is very well preserved and the trees are well preserved. For those of you who want to stay in a five star resort hotel with clean white sand beach, then hotel in Nusa Dua Bali area, maybe you can prioritize for your place stay during vacation in Bali. 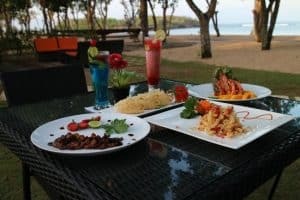 In Nusa Dua, there are some recommended of the best food ever that you should have. If you want to eat crispy duck, then Duck Bengil will be your favorite eating place. The Bengil duck is also famous for its Betutu Duck or its smoked duck. It is also one of Bali’s famous traditional dishes. When it comes to duck restaurants, Bebek Bengil is the best on the island. Bebek Bengil is the Indonesian name of Dirty Duck. Although its name has the word ‘bengil’ on it, everything you will see and eat at the Bengil Duck Restaurant is very hygienic. The menu at this restaurant is almost all related to ducks. For example smoked duck, crispy fried duck, duck chilli sauce, or duck fried rice. 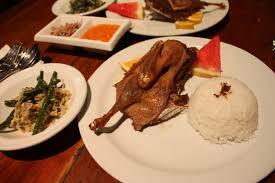 Bebek Bengil is the best Ubud food and you can eat crispy duck in Bebek Bengil, Nusa Dua too! But you have to order this food the day before. The next restaurant is Nusa Dua Beach Grill. It is also one of the cheapest restaurants in Nusa Dua, Bali. This place is located on the Coast of Geger. Therefore, the restaurant offers beach views. 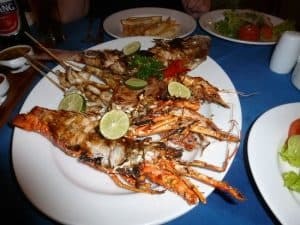 In addition, Nusa Dua Beach Grill also offers you seafood and grilled meat with large portions and affordable prices. Our recommendation is Red Crab Fettucine with White Wine Sauce. Pizza will always be our right choice when thinking about food. Children will surely love the choice too. 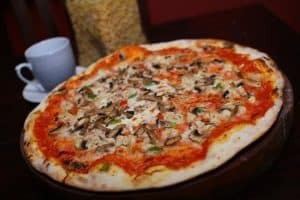 In Nusa Dua, you can go to Nusa Dua Pizza restaurant. You can enjoy the Italian pizza that is so delicious. There you can eat authentic Italian pizza. There is a sense of classic and contemporary as well. To achieve a different taste in pizza, the restaurant cooks pizza on a wood fire. Our recommendation menu here is Pizza Hawaii. 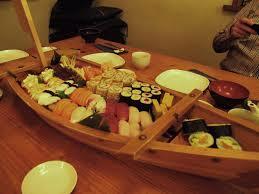 If you want sushi, then you can go to Matsuri Japanese Restaurant. Usually, Japanese cuisine is expensive, but it will be different if you go to Matsuri. This place offers a wide selection of Japanese dishes. The kinds of sushi that served here is so variou. You can choose your favorite sushe then grab it to you tummy. How about the price? Do not worry, the price is affordable! This restaurant is very popular in Nusa Dua. Our recommendations are tuna sushi, salmon rolls sushi, Maki sake, and Gyoza. The price is cheap and the place is also very aesthetic. For those of you who want to try Indonesian cuisine, Ketut’s BBQ Kitchen restaurant is highly recommended. You know that the cuisines in Indonesia has the strong taste. Besides, the sea food here is also has the really different taste. You can enjoy the good side dish that made of shrimp, squid, and so on. You can also choose to dine-in or take away. The reason why people come to this place is because of its large portions. 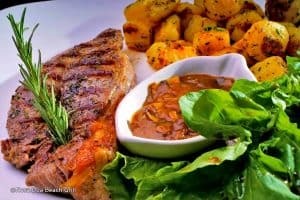 The portions are worth the price because you also get great meat with high quality ingredients. Warung Dobiel offers traditional Balinese dishes. You can try a variety of local foods such as smoked chicken and babi guling. If you want to have a sumptuous meal then you can skip this place. 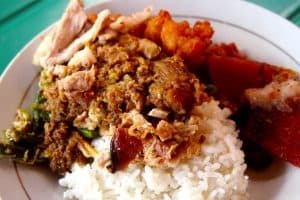 But if you are looking for an affordable place with delicious Indonesian food, then Warung Dobiel is the right choice. This place is also famous for its fresh ingredients. This place is very popular among locals and tourists alike, so you should be prepared to wait to sit at the table. This restaurant is loved by many locals and tourists. The food is very affordable and there are many outstanding dishes as well. You can get a plate of classic fried rice for only USD 2! If you want a meat dish, you can try the roast beef ribs for USD 7. This restaurant is famous for Indonesian cuisine such as fish soup, roast meat, and kebabs. Warung Bule and Susy also change the lineup regularly so people can enjoy various dishes to try. Our recommendations are tofu, mixed rice, choice of vegetables, as well as meat and fish served with rice. If you eat too much local food and you want to eat western food, then come to Nyoman’s Beer Garden. It offers a perfect blend of Indonesian, Asian and German cuisine. For those who love European food will love this place. 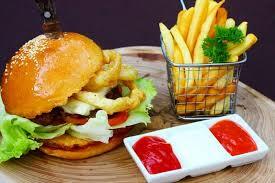 Nyoman’s Beer Garden has a great selection of food such as burgers, pasta, sandwiches, sausages, pizzas, and more. You can also choose a set menu such as Asian, seafood, German or Vegetarian dishes. The menu includes appetizers or soup, main course, as well as dessert. Chinese food is always the best if you do not like local food there and if you need a place to eat at an affordable price too. The typical Chinese restaurant in Nusa Dua is Hong Xing Club and Restaurant. This place has famous noodles and dim sum. This restaurant is very popular with locals and tourists. Hong Xing is the perfect place for a family dinner. Our recommendations in addition to both dishes are Singapore chilli crab, fresh oysters, and steamed shrimp. 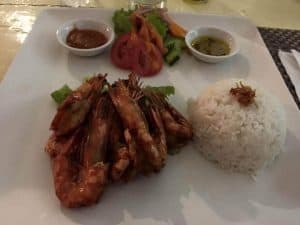 Mai Mai is a great place for lunch in Bali. This place has cheap dishes and also they have many delicious dishes that will satisfy everyone. Mai Mai offers international dishes so you can enjoy plenty of food there. The main highlight of Mai Mai dishes is fresh seafood. In addition, you can select the ingredients and then proceed with the cooking chef. The good taste in Mai Mai is also come from sea food that served there. You can go there if you want to eat sea food. Those are some recommendations of the best foods in Nusa Dua. All in all, Nusa Dua is located in the central of Bali. 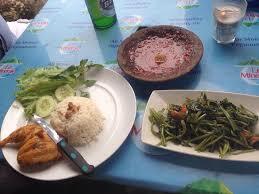 That is why it is very easy for you if you you want to hunt some Balinese culinary there. Nusa Dua is just an amazing part of Bali.